Desionne Franklin described the moment he and his girlfriend were inside a Toyota Prius, trying to escape a powerful river of mud, rocks and water as something out of a movie. "But it was my movie at the time," he said. "It was unbelievable. 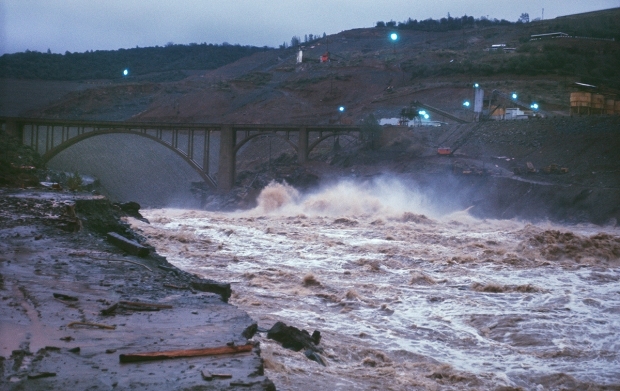 To feel that rush of water, mother nature pushing you like that, it was overwhelming." When the storm came Tuesday, he and his girlfriend realized they needed to evacuate their friend's home on Country Club Drive in Burbank immediately. "We all looked out the window and it was trees, rocks, boulders and an occasional car just flying by," said Ashanka Givens, his passenger. 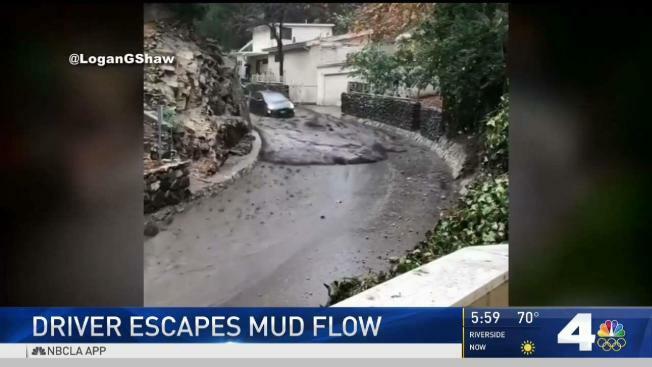 A Prius caught one of the powerful waves of mud that washed down Country Club Drive Tuesday in Burbank after a winter storm slammed Southern California with downpours that triggered flash floods. Firefighters did not find the driver, but said they did not receive any reports of injuries in the slide, which blocked streets and forced people out of their homes in the hills above Burbank. They packed up their Prius and started driving. "At first I was going slow and I could feel the rumble and I'm going to take my time, but then all of a sudden, you hear this loud rush of water at the back of the car," Franklin said. That rush of water not only caught up to them but quickly reached the car windows. "By that time my whole life was flashing before me, 'Oh, this is not about to happen right here,'" he said. Givens said they were hydroplaning. "The tires aren't even hitting the ground," she said. Franklin couldn't control the brakes or the steering. Incredibly, the couple made it safely down the hill, with no damage to the Prius, which Franklin admits wasn't his type of car, but thought it would be good for ride sharing. "I got out, pat the bumper a little in the back, put it back in place and kept going," he said.